The Accidental Prime Minister Trailer: Take a look at the hilarious memes and jokes on this film. 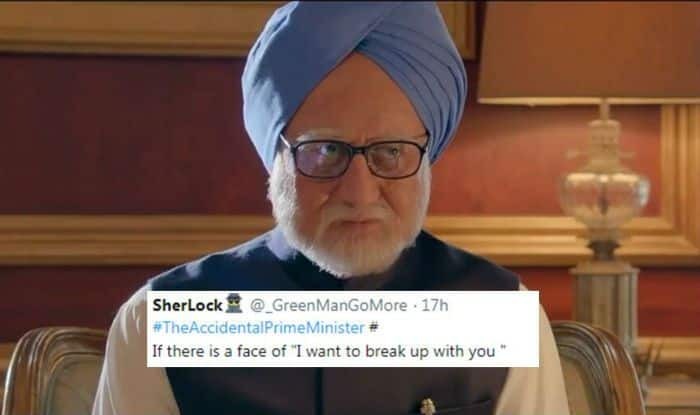 The trailer of Anupam Kher’s upcoming film ‘The Accidental Prime Minister’ is out and it has received the mixed reactions from Twitterati. A few Twitter users are praising the trailer while others have criticised it. On the other hand, there are some who have targetted The Accidental Prime Minister to make hilarious jokes and memes. Twitter is flooded with the same. Anupam Kher is playing the role of a former Prime Minister Manmohan Singh, the film is based on the book with the same name authored by Sanjaya Baru. The movie is set to release on January 11, 2019. The movie is set during the time of Manmohan Singh’s prime ministerial regime from 2004-2014 and circles around the life of the politician-economist. The political drama is directed by Vijay Gutte. The screenplay is by Vijay Gutte, Mayank Tewari, Karl Dunne and Aditya Sinha. Apart from Kher, the cast includes German actor Suzanne Bernert as Sonia Gandhi, Arjun Mathur as Rahul Gandhi and Aahana Kumra as Priyanka Gandhi. Meanwhile, the Congress party’s Maharashtra youth wing has raised objections on the trailer after issuing a letter to the film producers. It has mentioned that the filmmakers have shown ‘incorrect presentation of the facts’ and thus demanded a special screening of the film. They have even asked the producers to delete some scenes on incorrect facts.